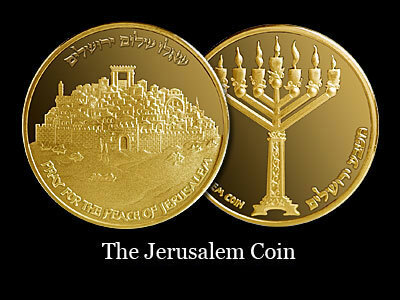 An exclusive collection of commemorative coins minted in honor of Jerusalem's historic Jubilee celebration. Your purchase supports vital projects that rebuild the ancient city and insure that Jerusalem remains the undivided capital of Israel. 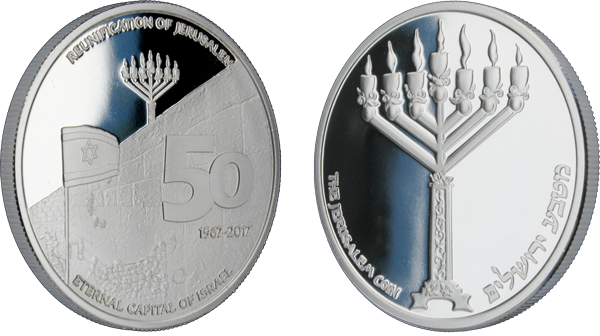 The reverse side features a menorah of seven branches, an enduring symbol of peace and light unto the nations. We pray for the peace of Jerusalem and for the temple menorah to once again radiate eternal light throughout the world. Over 3000 years ago, King David established Jerusalem (Yerushalaim) as the capital of Israel. Using modern archeological evidence, the City of David unearths the truth of biblical events and reveals the unbroken link between the Jewish people and Jerusalem. 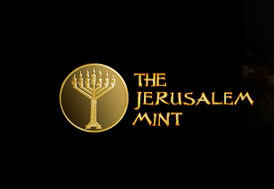 A rare opportunity to own a magnificent limited edition Jerusalem treasure. 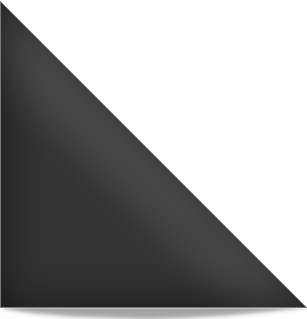 And to invest in the future of the ancient capital of Israel.